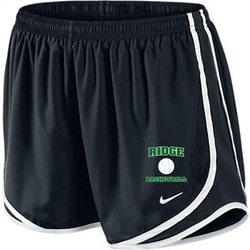 Orders for Ridge Basketball apparel is now open. PLEASE MAKE SURE THAT YOUR SHOPPING CART IS CORRECT BEFORE CLICKING SUBMIT. An order confirmation will be sent to the e-mail you provided (make sure you use a valid e-mail address; this e-mail is used for ordering purposes). ALL CUSTOM ORDERED PRODUCTS ARE NOT RETURNABLE, EXCHANGEABLE or REFUNDABLE. Shipping charges are NOT refundable. Please select "pick-up" for your shipping option and your order will be distributed by Maria Mahon. You may contact her with any questions. Sizes are all Men or unisex except the shorts. 100% Softex Polyester. Unlined & lightweight. Pullover design accented with black zippers (dyed-to-match on Pink & Columbia blue). Underarm grommets for ventilation & elasticized cuffs. Open hem with shockcord drawstring. Half-moon at neck for easy private/custom labeling. Coordinates with the Rival Pant, style 9657. Also available in youth, style 8904. EXCEPTIONAL COMFORT AND PERFORMANCE. The Nike Tempo Track 3.5" Women's Running Shorts feature built-in briefs for comfort and fabric that wicks sweat away from the skin to help keep you dry while running. Dri-FIT fabric to help keep you dry and comfortable. Side mesh panels for extra ventilation. Internal pockets to keep small items secure. Built-in briefs for support and coverage. Contrast panels and trim for style. Body: 82g. 100% polyester taffeta. Mesh: Dri-FIT 141g. 100% polyester circular knit. Liner: Dri-FIT 90g. 100% polyester (100% recycled) crepe. Mint Classic Unisex Long Sleeve, Crew Neck Spirit Jersey® with a comfy over-sized fit. Featuring a white back print with "BASKETBALL" on the curve and "RIDGE" on the tag.